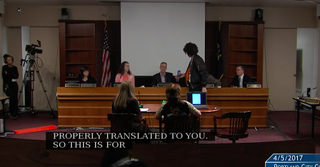 A protester in Portland, Ore., tried to be like Kendall Jenner during a City Council meeting and offered Mayor Ted Wheeler a can of Pepsi he pulled out of his coat pocket. Carlos Enrique (2:50:00 mark) stated that he was a former journalist who has been covering City Council meetings and that he was surprised at how many people attend the Portland meetings and protest and yet the mayor still signs unpopular ordinances anyway. Enrique then stood, walked toward Wheeler and pulled a can of Pepsi out of his pocket. Security quickly approached Enrique and escorted him away. Wonder what Wheeler meant by “If this was the Boston City Council, this would have ended differently”? Here’s a word of advice. Don’t go around giving government officials or law enforcement cans of Pepsi. You are not Kendall Jenner. They’ll probably consider it contraband.